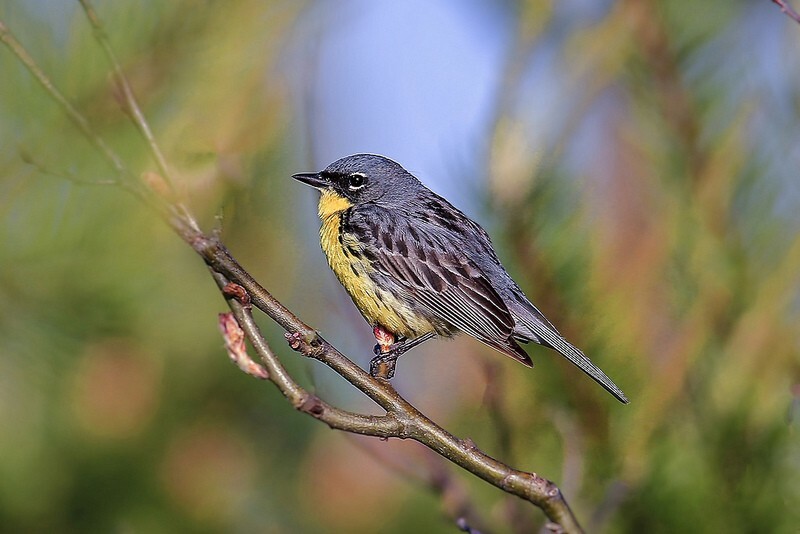 In partnership with Huron Pines, Kirtland’s Warbler Alliance, U.S. Guided Kirtland’s warbler tours are the best opportunity to view this endangered songbird, as nearly all Kirtland’s warbler nesting areas are closed and posted against public entry during the nesting season. Kirtland’s warblers are rarely seen in Michigan outside of their nesting habitat. Rain or poor weather makeup dates will be the following day (Sundays). You may call Camp Inn Lodge. We will also send out Facebook notifications if you “like” our Facebook you will receive at registration. Just indicate “going” in KW Event. Sign in Time is 7:30 a.m so please arrive a few minutes early. A short introduction and video about the Kirtland’s will be shown. Then, participants will follow the guide and carpool in their own vehicles to the U.S. Forest Service KW PMArea also in Oscoda. Reservations – Reservations are strongly encouraged 24 hrs. in advance and may be best made by calling the Lodge at 989-739-2021, or via email at campinnlodge@gmail.com. For more information visit their website at www.CampInnLodge.com and click on “events”. Tours are FREE but limited to 12 people per guide. If tours are not filled, walk-ins are allowed.